Born 27 November 1902 in Framwellgate Moor, county Durham [registered in Durham, March 1903]. According to the 1911 census, George is the youngest of six children to Isaac and Mary. They live at 108 Pump Row in Framwellgate Moor. His father is a coal mine hewer. According to the 1939 register, George works as a steel clerk and a reinforcement concrete labourer, and is married to Isabella. They live at 56 Devonshire Road in the Linthorpe area of Middlesbrough. Married to Isabella Hall (b.13 February 1903) [registered in Durham, March 1922]. Died 7 March 1966 in Middlesbrough, aged 63 years 100 days [registered in Middlesbrough, North Riding, March 1966]. Height/Weight 5' 9", 11st. 12lbs . Club(s): Started his life as a pit boy, but played football with the Durham chapel team in 1921, and soon played for Esh Winning FC and Tow Low Town FC, from where he was offered a trial with Durham City FC, joining as an amateur in 1923, and turning professional in June 1924. His twenty goals in the 21 league appearances soon got him noticed, and so joined Middlesbrough FC on 6 October 1925 for a £800 transfer fee, cancelling out Durham's debt to the Boro. Camsell re-signed for a fifteenth season, on 6 April 1939, having amassed an astonishing 325 league goals in 419 league appearances, before the breakout of war suspended the League programme. On 11 November 1939, Camsell played for Stockton FC in the North-Eastern League, as he had not been picked for Boro' for that week. But he was soon picking out the goals for Boro again, well into his forties, making his final appearance in 1941. 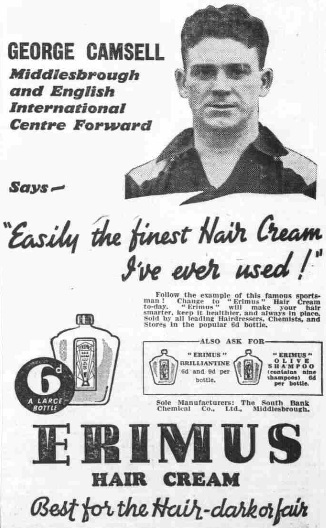 Distinctions: Fronted an advertsing campaign in 1936 for Erimus Haircream, made by his native South Bank Chemical Company (left). Camsell refereed the Berwick Infirmary Cup Final between West End United FC and Chirnside Amateurs FC on 23 July 1947. West End won 4-3. He was banned from doing the same in 1948, after a disgruntled 'fan' reported him for participation in non-FA Affiliated matches. Player number One of four who became the 540th players (543) to appear for England. First match No. 165, 9 May 1929, France 1 England 4, an end-of-season tour match at Stade Olympique Yves-du-Manoir, Colombes, Paris, aged 26 years 163 days. Last match No. 204, 9 May 1936, Belgium 3 England 2, an end-of-season tour match at Stade du Centenaire, Bruxelles, aged 33 years 164 days. Remained with Middlesbrough FC after retiring, firstly as a coach after WW2, appointed on 2 January 1947, and chief scout. From October 1956, he was the assistant secretary until his retirement in December 1963. - An English Football Internationalists' Who's Who. Douglas Lamming (1990). Hatton Press, p.58. "LORRY DRIVER CLEARED AT DURHAM INQUEST.